Full Tilt Poker has a long and rich history. Here we have chronicled everything from pre-Black Friday updates to Full Tilt Poker since their re-opening under the management of PokerStars in late 2012, early 2013. Continuing a series of great promotions since the re-launch, Full Tilt Poker is now offering a 100% reload bonus up to $100 through January 6th. You can also claim the bonus simply by transferring funds from your PokerStars account to Full Tilt Poker. For more information visit PokerStars.com, there you will also find instructions on pairing your PokerStars and Full Tilt Poker accounts. It is rare to see Viktor and Gus playing on any tables lower than the highest there are, but Full Tilt Poker is now offering a chance to play with both of them for as low as $10. Viktor and Gus now have their own tables “The Great Dane” and “Isildur1” ranging from the micros to middle stakes ring games. Not only that, but playing with the pros can earn you free ring game tickets! Once any of the pros will sit down at a table, any player that has been playing at that table for at least 10 minutes will earn ring game tickets worth 50 big blinds at pot limit and no limit tables and 25 bug bets at fixed limit tables. January 6th will see the start of Mini FTOPS and if the FTOPS series was a little too expensive, then the Mini FTOPS is just what you are looking for! 35 events at a tenth of the buy in’s of the FTOPS series makes this series as affordable as they get. 2012 had some ups and downs for the future of Full Tilt Poker, including the falling apart of a deal between the Groupe Bernard Tapie and the US Department of Justice. But in the end, a deal struck between the US DOJ and PokerStars resulted in Full Tilt Poker re-opening their doors on November 6th, 2012. The investors’ Groupe Bernard Tapie is now able to purchase the Full Tilt assets from the US Department of Justice. Player funds are still in limbo, indictments are still pending, and there has been no news on the pending GBT-FTP deal in months. The Groupe Bernard Tapie releases a statement citing two major issues which prevented a deal with the DOJ from happening. The first was that the parties could not agree on a plan for the repayment of the non-US players. The GBT wanted to make the majority (94.9%) of players balances to be available for play immediately, with a temporary hold on player withdrawals. Complete access to funds, including withdrawal availability of all non-US player funds was planned for a specific date, but that date was not mentioned in the GBT statement. The DOJ ultimately insisted on full repayment plus a right of withdrawal within 90 days for all players. The right of withdrawal was a surprise which wasn’t mentioned until months after negotiations commenced. The second major roadblock to completing the deal revolved around the legality of forfeiture of assets under non-US law. Since the majority of Full Tilt Poker’s assets were located outside of US jurisdiction, additional deals and legal discourse would have been required to finalize the deal to appease the laws of all affected assets in their country of origin. Both PokerStars and the US Department of Justice confirm that they’ve reached a deal that would settle all charges against PokerStars. This deal will also allow for PokerStars to purchase Full Tilt Poker, including all of the FTP assets and player debt. US Player fund balances will be distributed by the Department of Justice for the players of both PokerStars and Full Tilt Poker. No assurance is made whether or not US players will receive all or only a portion of their funds. PokerStars is paying a total of $547 million to the United States government. This amount is sufficient to both settle all charges against PokerStars and purchase all of Full Tilt Poker and its assets. The total will be paid over the length of three years. This agreement also involved the forced resignation of PokerStars president, Isai Scheinberg. That position will be held by his son, Mark Scheinberg. The agreement does not nullify or otherwise affect any criminal charges (pending or future) against individual members of PokerStars or Full Tilt Poker. This includes Isai Scheinberg himself. Full Tilt Poker re-opens its doors under the management of PokerStars. Players from all countries other than the United States, France, Italy, Spain, Denmark, Belgium and Estonia are eligible to play in real money games at Full Tilt Poker. Players of countries on this list (other than the USA) are still able to play for real money at PokerStars. Full Tilt Poker began the year with a very bright future. They signed more players and celebrities to their team, had a very large share of the online poker market, and had big plans. After April 15th, known in the commuinity as “Black Friday” everything fell apart for Full Tilt Poker. It would take over 18 months before they got back on track. Shortly after leaving his place as the face of UB (UltimateBet), Phil Hellmuth has reportedly met with the heads of Full Tilt Poker to discuss a potential deal. There have been no confirmed reports of this meeting, let alone any statement by FTP to confirm or deny Hellmuth’s alleged desire to become part of the team of pros on Full Tilt Poker. Renowned life and business coach Sam Chauhan is signed to the Full Tilt Poker team. He will be developing a coaching program to help improve the mindset of poker players, exclusively at the Full Tilt Academy. Chauhan expects that his program will improve players’ poker mentality, including such aspects as controlling tilt and maintaining a winning attitude. Chauhan has worked with a number of high-profile professional poker clients such as Antonio Esfandiari (his first poker pro client), Chris Moneymaker and Phil Hellmuth. He has worked with CEOs, businessmen, athletes and celebrities to help improve their lives and success in life. Shortly after Super Bowl XLV, Full Tilt Poker announced their signing of Emmitt Smith, the NFL’s all-time leading rusher. Smith will compete in a number of live poker tournaments wearing the Full Tilt Poker brand name, beginning with the National Heads-Up Poker Championship. March 5: Greg Raymer Full Tilt Poker Sponsorship? Prior to the NBC Heads-Up Championship, Greg Raymer was recently spotted wearing a Full Tilt Poker badge. The 2004 WSOP Main Event champion recently left Team PokerStars after management forced a number of long-time sponsored players to take a pay cut. According to Bluff magazine, this Full Tilt Sponsorship for Raymer during the NBC Heads-Up Championship Tournament is a one-time deal, but it could extend beyond this tournament. Full Tilt Poker launches an uber high-roller tournament series which it has dubbed as the “tournament of tournaments”. The Onyx Cup will consist of six live tournaments held around the world with buy-ins ranging from $100,000 to $300,000. Each of the events will award regular cash prizes as well as points. The player with the most points at the end of the series will be crowned champion, given a luxury sports card and have their name permanently engraved on the Onyx Cup trophy. Department of Justice indictment is enacted against Full Tilt Poker, as well as Pokerstars and the Cereus Network (Absolute Poker and UltimateBet). The dot com websites for each site are blocked, showing a full page logo of the US Department of Justice. Full Tilt Poker issues a statement saying that they are working with the US Department of Justice to facilitate payments, but are having great difficulty due to their previous payment processors being unusable. Full Tilt issues a second statement: They apologize for players not being able to withdraw funds and they say that their non-US operations will be returning to normal. Full Tilt Poker claims that they are not bankrupt, but are unsure as to when their US players will be paid out. Citing defamation of character due to the public rage he received due to the alleged slow and inadequate response by Full Tilt since Black Friday. Ivey’s statement was accompanied by a civil lawsuit against the California-based software company TIltWare LLC. Ivey sought damages of $150 million. Full Tilt Poker is rumored to be having more payment processor and liquidity issues than they are letting on. The total shortfall could possibly to the tune of $60 million. The Alderney Gaming Control Commission suspends Full Tilt Poker’s gaming license, resulting in a complete shutdown of fulltiltpoker.com. After flying out to Ireland to meet with Full Tilt Poker management, Ivey is convinced that FTP is taking steps to see that player funds are returned. He voluntarily dropped his lawsuit which was filed a month earlier. Full Tilt Poker enters negotiations with an unnamed European investor in an attempt to solve their financial shortfall. Full Tilt ends up being short more than twice as much as originally rumored two months ago. They confirm that a shortfall of deposits was caused by funds being credited to player accounts, without Full Tilt Poker ever actually receiving those funds. No exact amount is stated, but an estimate of $130 million seems to be fairly accurate. After digging through the records and business practices of Full Tilt Poker, the US Department of Justice amends its original civil complaint, claiming that FTP was a Ponzi scheme. Howard Lederer, Chris Ferguson and Rafe Furst are added to the list of defendants. The DOJ alleges that FTP owes $150 million to American players, plus another estimated $150 million to players from the rest of the world. Total debt: $300 million. After months of legal and financial difficulties for Full Tilt Poker, with no end in sight, the Alderney Gaming Control Commission decides to revoke FTP’s gaming license permanently. It is reported that the US Department of Justice and the investors’ group GBT (Groupe Bernard Tapie) have come to an agreement which would allow for the GBT to purchase Full Tilt Poker and their debt. A legal agreement between the DOJ and an investor or investment group was required before any deal between Full Tilt Poker and outside investors could happen. Shareholders of FTP would now be able to vote on the proposal from the GBT. A tentative deal regarding the transfer of Full Tilt Poker’s assets to the GBT is agreed on. This step would involve the DOJ seizing FTP’s assets, then handing them over to the investors’ group. The US Department of Justice issues a legal opinion stating that their new interpretation of the 1961 Wire Act is that it only applies to the prohibition of sports betting across state lines, not within-state lotteries. By extension, this logic is easily applied to the international online poker being significantly different from sports betting. This is very significant, since the Unlawful Internet Gambling Enforcement Act of 2006 cited the 1961 Wire Act as the basis of determining what can be labeled as an act of “unlawful internet gambling”. The DOJ offered no comment on what the proper interpretation or scope of the UIGEA should be. Full Tilt Poker continues to grow in popularity. A big part of their success is due to their innovative nature and their team of well-known poker professionals. Rush Poker becomes one of the most unique and innovative ideas for poker since the advent of online poker itself. Players can now play many times the amount of hands per hour compared to regular tables. Players love this new lighting-fast poker format. Full Tilt Poker applies for patents on Rush Poker all over the world, as other sites begin developing their own versions of the popular game. It is reported that a Manhattan federal grand jury is investigating Full Tilt Poker and a few named individuals (including Howard Lederer and Chris Ferguson) for non-compliance with gambling and money-laundering laws. The US Department of Justice claims that online poker violates the Interstate Wire Act of 1961. Also known as the Federal Wire Act, this law was originally intended to prevent sports betting and other wagers from being accepted across state lines into states which do not endorse gambling. The law was worded as: the placing of bets and other wagers on “any sporting event or contest” as well as the transmission of “money or credit as a result of bets or wagers” across state lines being punishable by fines and/or a prison term of no more than two years. Full Tilt faces s long string of lawsuits, but continues business as usual. Lary Kennedy and Greg Omotoy are allegedly caught using multiple accounts and “bots” (automated software) on Full Tilt Poker. The pair attempt to sue Full Tilt for the closure of their accounts and the seizure of $80,000. They allege that Full Tilt, and a number of its members, are guilty of fraud, libel, slander, false advertising and rackteering. Their suit is eventually dismissed on April 26, 2010 due to the lack of details and evidence in their claim. The Judge said that Kennedy may re-file the complaint in a federal court if he was able to correct these points. Traffic increases quickly and steadily at Full Tilt. Their share of the online poker market increases, but they still lag behind the behemoth known as PokerStars. Gowen claimed that in 2004 she was offered 1% ownership in the company in exchange for her promotion of the fledgling online poker site. The suit was initially dismissed by a trial court, but was later reinstated on an appeal. The suit was later dismissed in February, 2010. 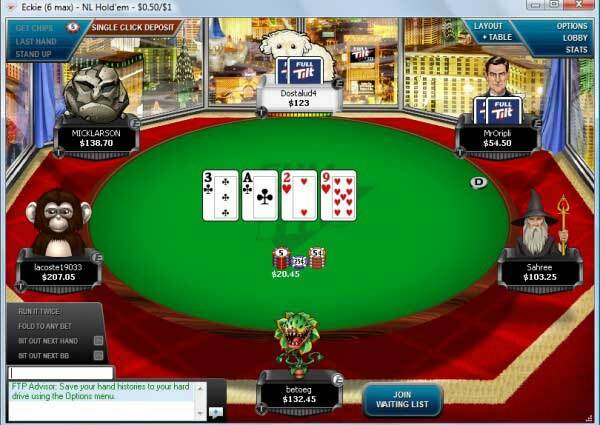 The massive influx of players requires Full Tilt Poker to improve its servers and software. Network traffic continues to grow as the “Learn, chat and play with the pros” catchphrase brings in even more new players. NBC unveils a new show named “Poker After Dark”. The show features a shorthanded table of well-known pro players in a winner-take-all tournament format. It differs from all other poker shows in that they show the vast majority of hands played, rather than a heavily edited montage of the most exciting hands. Each week one tournament is played, with one hour long episode per day, plus a special recap episode on Friday. The ratings show immediate success, particularly among males aged 18-34. A number of artistic Full Tilt Poker commercials are featured during the breaks, helping to spread the idea of poker being a fun and mentally challenging game with elements of both luck and skill. Full Tilt Poker continues to grow in 2006. They experience a huge influx of players near the end of the year after the UIGEA is passed, causing US players from other sites (notably, Party Poker) to search for a new site which still accepts American players. While the UIGEA doesn’t explicitly make it illegal for Americans to gamble online, it does make it illegal for banks, credit cards and other financial institutions to transfer money to offshore online gambling websites. Up to this point in time, PokerStars and Party Poker were the two largest online poker sites. Full Tilt Poker had a respectable player base, but was not one of the major online sites. In response to this law passing, Party Poker left the US market, causing a large number of US players to look for a new site. The majority of these players found their way to Full Tilt Poker and PokerStars. This ended up being a great boon for Full Tilt Poker. Their online poker room expanded very quickly and they became one of the largest online poker sites in the world within a couple years. Full Tilt Poker tinkers with their image and experiences steady growth over the course of 2005. There is still much work to be done to separate them from the rest of the pack of online poker sites sprouting up monthly. According to Howard Lederer, it was way back in 2005 that Perry Friedman told the board that Full Tilt Poker’s business was getting too big and complex. Friedman later stepped down from his place on the board in 2005 or early 2006. Friedman is a respected pro poker player, holding one bracelet for his 2002 WSOP win of the $1500 Limit Omaha Hi-Low Split 8 tournament. He was also one of the founding members of the “Tiltboys”. Online Poker is booming thanks to Chris Moneymaker’s $2.5 million World Series of Poker Main Event win. His Cinderella story began with winning an online $39 satellite on PokerStars, which gained him entry into the WSOP Main Event. His highly publicized win then propelled online poker into a huge boom, now referred to as the “Moneymaker Effect”. 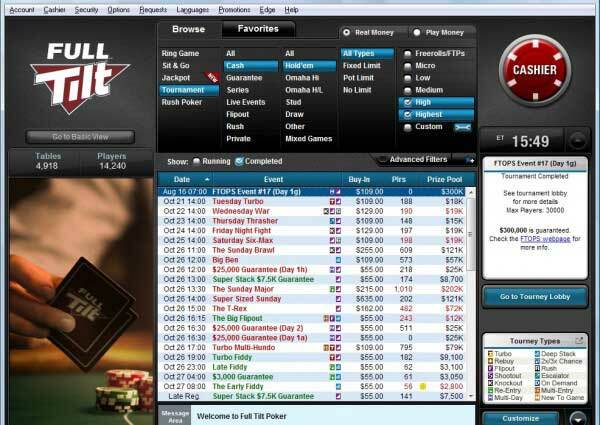 TiltWare starts developing their future online poker site, Full Tilt Poker. Full Tilt Poker is launched by its parent company TiltWare, LLC. At this time it is only open for beta testing/play money. Full Tilt begins processing payments and offering real money games.